Aerogel is a mesoporous, solid material derived by replacing the liquid component of gel with gaseous substitute to form interconnected nanostructure with high porosity. Aerogel is solid in state but its porous nature makes it extremely light weight and exhibits high thermal resistance, low density, and low thermal conductivity making it one of the most suitable material for insulation purposes in various end-use industries. Globally aerogel is used in various industries such as oil & gas, building & construction, transportation, performance coating and many others. Growing demand for superior thermal resistive material and superior performance over conventional insulation materials is driving the increasing demand for aerogel in various end-use industries. Increasing demand for light weight and fuel efficient vehicles is expected to pose a huge opportunity for aerogel market in the near future. However growth for the aerogel is expected to face hindrance due to higher cost as compared to the conventional insulation materials. This report identifies the aerogel market size in for the year 2014-2016, and forecast of the same for year 2021. 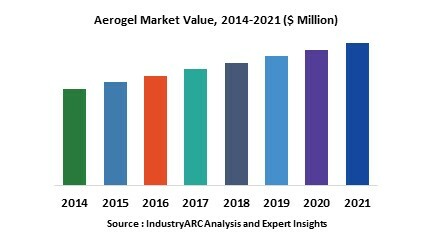 It also highlights the potential growth opportunities in the coming years, while also reviewing the market drivers, restraints, growth indicators, challenges, market dynamics, competitive landscape, and other key aspects with respect to aerogel market. North American region represented the biggest market share in the global aerogel market Asia-Pacific. With the second highest market share amongst all the major regions. Aerogel market is expected to witness the highest growth in the Asia-Pacific region due to increasing demand for superior and high performance insulation materials and increasing popularity of aerogels in the various end-use industries which are experiencing significant growth in the region. This report has been further segmented into major regions, which includes detailed analysis of each region such as North America, Europe, Asia-Pacific (APAC), and Rest of the World (RoW) covering all the major country level markets in each of the region.